I've just released this in the usual Edge folders. See https://github.com/dc42/RepRapFirmware/blob/dev/WHATS_NEW.md for the change list. Chrishamm has released DWC 1.19.3 so I have included that in the Edge folders too. Did you implement the stall detection? No, there wasn't time to do that in this beta. Briefly tested the 4-point math this AM. It seems to be far happier and actually gives realistic numbers, as opposed to previous which would be way off if things needed anything more than a marginal adjustment. Will mess with it more tonight. Just updated one of my deltas. Working well so far. I also updated last night, and things are working fine. Thanks for the feedback. The only bug in 1.20 I have found so far is that if you issues the M21 or M22 command, it always reports Error in DWC even though the command succeeded. Will be fixed in next beta. Is this the Error bug in DWC ? It keeps flashing every 5 or 10 seconds. Seems to be printing fine, just repeating the error screen over and over. Maybe the g-code generated by your slicer repeats the wrong temperature. The blue box in the camera feed box with the temp error. 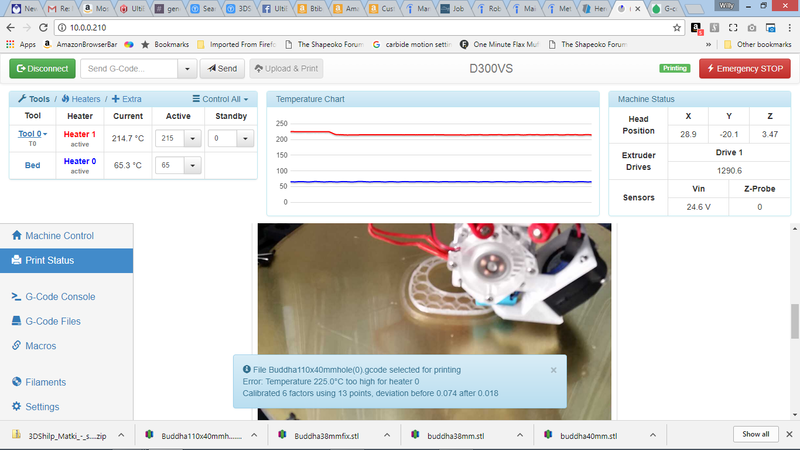 My guess is that you have made a mistake with your slicer settings, and as a result the Gcode file is asking to set the bed temperature to 225C instead of the hot end temperature. Look for the M140 or M190 commands in the gcode file to check this. Working great on the RailCore. No issues at all. Thanks everyone for the feedback. Beta 1 is turning out to be very stable. I just switched to this release yesterday, and my 2 prints worked fine. But I still have some AJAX errors (they have never been very frequent though). Have you worked through https://duet3d.com/wiki/WiFi_disconnections_and_AJAX_timeout_errors ? Yes, but I could not improve things. I may try to switch to the ESP-07S (once the warranty has expired ;)).